The stepping down, under duress, of long-term Gambian president Yahya Jammeh clearly illustrates the impact of credible collective security. However, for this ‘African solution’ to be replicable, much will need to be allayed regarding possible future attempts to renege on the deal, which reportedly provides him immunity from future prosecutions. The agreement followed a month of uncertainty over the acceptance of the results of Gambia’s 01 December 2016 presidential poll, which saw opposition candidate Adama Barrow gain around forty-five per cent of the vote, nine per cent more than Jammeh. 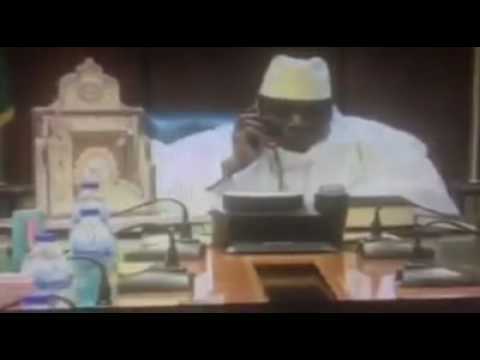 Jammeh, who had ruled the country for over twenty-two years since attaining power in a bloodless coup in 1994, initially conceded on 02 December through a phone call, which subsequently went viral. However, a week later on the 10 December he announced his intention to contest the results and filed a challenge at the country is Supreme Court. Mediation efforts, under the auspices of the economic community of West African States (ECOWAS) have since been ongoing, and, after numerous dead ends, culminated in the 20 January agreement. Jammeh’s acceptance of the deal, which saw him transported to the Guinean capital Conakry en route to Equatorial Guinea, was greatly influenced by the credible threat of force wielded by the West African sub-regional bloc. To this effect, ECOWAS members threatened to forcefully remove him if the election result was not accepted and implemented. Further, troops from ECOWAS states were dispatched to the Senegalese-Gambian border, and aerial support was to be provided by Nigerian forces. This ‘African solution’ was only achieved because of the success of previous ECOWAS missions in Liberia, Sierra Leone, and especially Cote D’Ivoire, which ensured that the threat to forcefully remove Jammeh was seen as credible. Initially formed to stabilize Liberia in the late 1980s following the first Liberian civil War, the bloc was influential in halting civil conflicts in Liberia and Sierra Leone in the late 1990s and early 2000s. Further, in Cote d’Ivoire after former president Laurent Gbagbo refused to relinquish power following his defeat in elections to Alassane Ouattara in 2010, ECOWAS troops, together with the French, were crucial in enabling Gbagbo’s capture. The fall of Gbagbo was significant as unlike with Sierra Leone and Liberia, Cote D’Ivoire constitutes one of the larger states in the bloc, and at the time, possessed a reasonably strong army. Further, unlike with Sierra Leone and Liberia, the Cote D’Ivorian government did not sanction this mission. This meant that the Bloc had acted militarily to ensure compliance with electoral results. Jammeh was thus confronted by a bloc, which had historically acted to enforce respect for electoral processes, even within powerful sub-regional states. Gambia, with a military of less than 5000 thus stood little chance. This was further worsened by Jammeh’s tetchy relationship with Senegal, and the fact that the country shares almost its entire border with it. The mission however could have been accomplished much quicker and the alternation of power could have gone much smoother. Jammeh only reconsidered his initial concession of defeat on 10 December once opposition parties, including now president Adama Barrow, implied that he would face trial at the International Criminal Court (ICC). Exacerbating this was the case of Charles Taylor, whose asylum to Nigeria and reported immunity from trial was ceased once Liberian president Allan Johnson Sirleaf requested his extradition in 2006; he now faces charges at the ICC for war crimes committed in Liberia in the 1990s. This set a precedent, hamstringing efforts by Guinea and Mauritania to negotiate a compromise wherein Jammeh would hand over power in return for immunity from prosecution. It is noteworthy that Sirleaf currently heads ECOWAS. It is thus likely that Jammeh would have fought harder to remain in power had he had a larger military and were it not for the military chief’s tacit support for the incoming administration. An implication of this is the observation that replication of this successful and bloodless regionally mediated alternation of power will be increasingly difficult. African countries need to develop a mechanism, which allows for accession to the ICC yet enables them to postpone and in instances halt the prosecution of heads of states when doing so would assist a peaceful transfer of power. This is significant on the continent, especially since leaders in Burundi, Sudan, the Democratic Republic of the Congo and even Zimbabwe are not likely to allow for electoral transitions unless immunity is provided. Aggravating this is the fact that other sub-regional blocs on the continent lack the capacity and will to implement such a mission were a leader refusing to relinquish control. In this regard, the inability to enforce a solution to the current Burundian crisis, wherein most of the powerful sub-regional states, including South Africa, have adopted a similar stance on president Pierre Nkurunziza’s ineligibility to stand for a third term in office is a stark reality of the continent’s inability to exercise and implement a more collective based mechanism promoting democratic consolidation. Jammeh’s extradition to Equatorial Guinea, a country that is not currently a signatory to the ICC, will postpone this peace-justice conundrum and the need to formulate a response which can accommodate both for the moment. However, the country remains a member of the ICC, despite Jammeh’s previously stated intention to withdraw the country’s membership. Further, President Barrow has acquiesced to the pressure placed on him by parties comprising the ruling coalition and continues to insist that the results of a truth commission will be sent to the court. This means that African states, especially ACOWAS members, will need to begin formulating a solution for this eventuality. Failure to do so risks impairing the credibility of mediation efforts and may result in leaders refusing to relinquish control in future, especially following the Charles Taylor debacle. Ebrahim Shabbir Deen is a researcher at the Afro-Middle East Centre, a research institute based in Johannesburg South Africa. His interests include political Islam, Middle Eastern politics, development issues, and climate change. He is a frequent media commentator on political events in the Middle East-North Africa region. He is Author of the book ‘Hezbollah vs. the Egyptian Muslim Brotherhood: A social democratic perspective’ 2012. He holds a Masters in International Relations from the University of the Witwatersrand and is an abbot Wigan Athletics supporter.